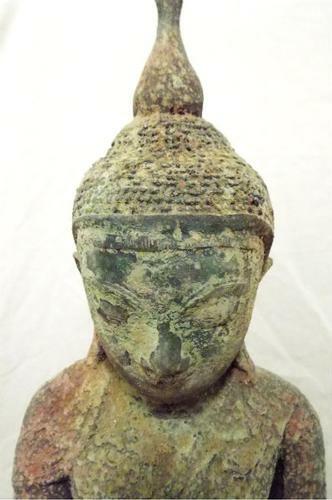 Rare Antique Burmese Buddha Statue from the late SHAN period of Burmese history. Rustic and beautiful. 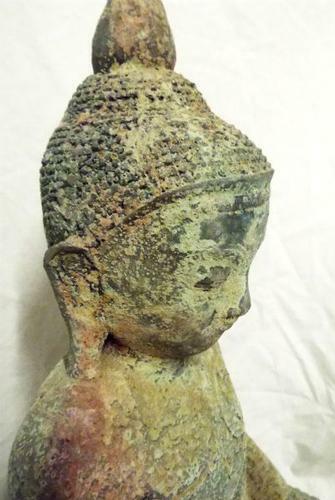 Classic Burmese Buddha features; Angular head, elongated ears. Tall triangular Ushina (Head top knot) down cast eyes with a peaceful and serene expression. This is an enlightened buddha meditating on spiritual enlightenment. This statue may have been buried at one time to protect it from marauders during the Thai and Burmese wars. Circa late Tai Yai period. 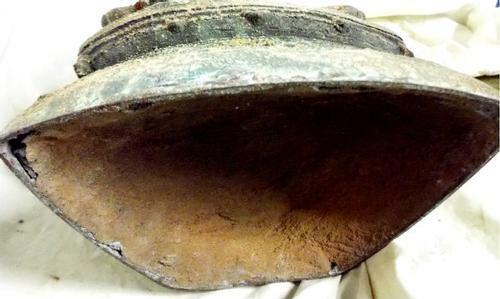 Origin: Burma (Modern day Myanmar) Material: Bronze Alloy, age related wear, no cracks or repairs. Dimensions: 22.5 x 10 x 7 inches Weight: 25 pounds. Certificate of authenticity included with purchase.